Redruth coach Ashley Morcom says he wants to keep his players' minds on the job of winning rugby matches amid ongoing upheaval at The Rec. The Reds have been hit by board resignations and the departure of director of rugby Adrian Edwards, but beat Hartpury College last weekend. "With regards to off-the-field stuff, I've tried my best to keep it off the field," he told BBC Radio Cornwall. "It's important we keep doing the same thing and get a bit of enjoyment back." 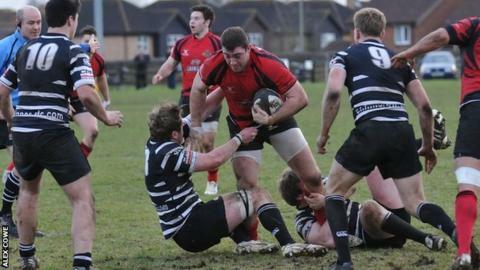 Redruth produced one of the surprises of the National League Two South season with their 32-29 win over top-of-the-table Hartpury College, but Morcom is keen that it does not end up being a one-off. "It is a big confidence-booster to us on the playing front and we need to replicate what we did," he said. "I've tried not to let the players dwell too much about what's happening so we've done quite well on that side of things." The fixture list throws up another difficult challenge in the shape of second-placed Ampthill on Saturday. "Looking at the reports, they've put some big totals on teams but by all accounts a lot of sides have dropped off towards the end of games which is when they rack up the points," he said. "There's a lot of experience and old seasoned campaigners who've been around so we need to make sure we out-enthusiasm them, if there's such a word! "It's important to be as abrasive and direct as we can and really put in a performance."